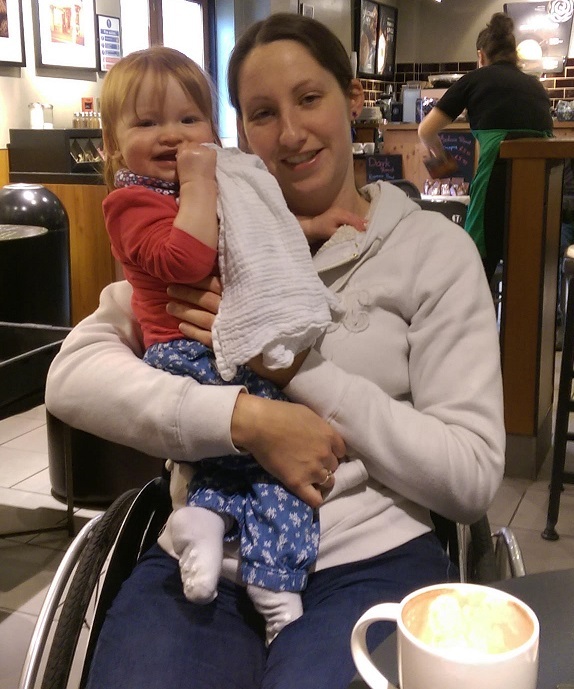 Lynn has a lot to cope with, she has mobility issues which confines her to a wheelchair most of the time AND a 10 month old baby yet every week she turns up with Libby for their Aquatots swimming session. She wheels herself and Libby onto the poolside and with the support of our teacher Amy she is able to pass Libby into the pool and then make her own way in after. Lynn is a keen swimmer and being in the slightly deeper pools that we offer means not only can the water support a lot of her weight and allow her to walk unassisted which gives her a sense of freedom it also is a great physical activity for her which does not harm her joints. Lynn decided to join Aquatots after a recommendation from a friend, she has always liked swimming and with daughter Libby also enjoying water she felt it was the perfect choice for an activity they could do together. Aquatots let Lynn and Libby come along to watch a session to see if she thought she could manage it. Lynn says “Amy was really friendly and seemed prepared to help me make it work. There were also lots of different pools to choose from so I could find a pool that was accessible for me and local”. Lynn is able to manage most tasks in the pool and if there is something she’s struggling with then she has always found a slightly different technique so she can manage it and teacher Amy is on-hand to suggest different ways to undertake activites and is always prepared to help. 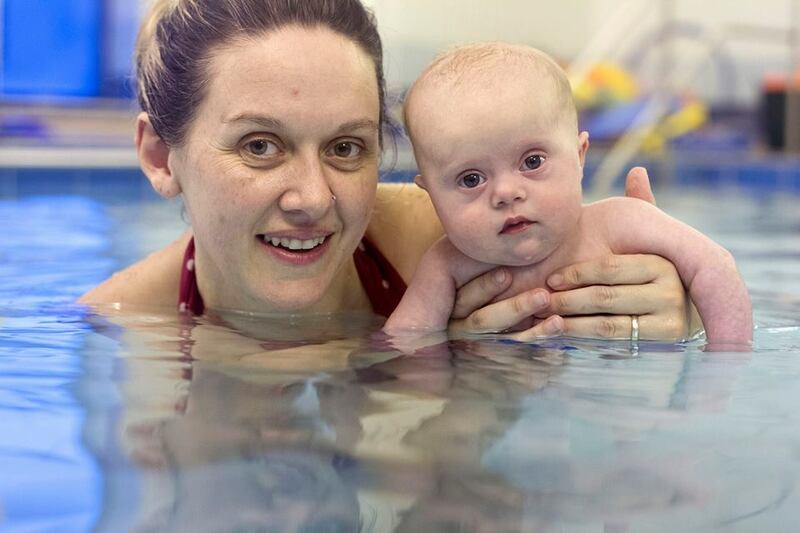 Lynn decided to share her experience with Aquatots as an example of how accessible our lessons are and how hard we strive to support each and every one of our swimmers so that the main objective of getting baby swimming at an early age can be achieved. Have you met our Superbaby William yet, this little chap made the news earlier this year. William, who has Downs Syndrome, needed open heart surgery last year to repair a hole in his heart. His parents Susan and Andrew wanted him to be strong enough to cope with the surgery so joined Aquatots when William was just seven weeks old, they undertook an 8 week Duckling course in our Paternoster Hydro pool, after just a few weeks his parents were seeing a difference in his once weak muscles which were getting stronger. 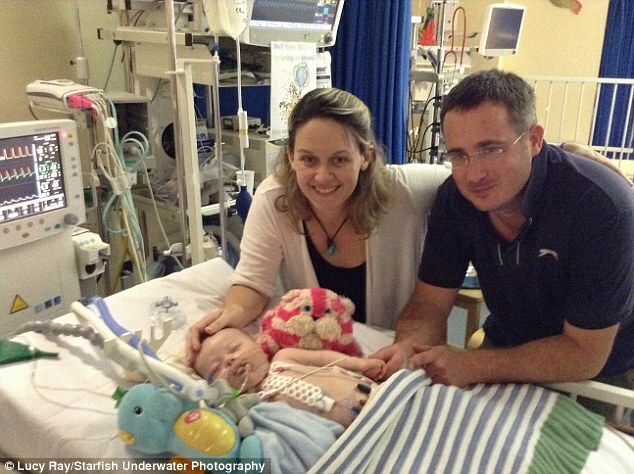 “The swimming has helped improve his muscle tone and gain strength in preparation for his surgery” says Mum Susan. After four months recovery, William was back in our Aquatots sessions and has progressed onto our Cygnet level. This entry was tagged #infant #baby #child #submersion #swimming #classes #lessons #Gloucestershire #Worcestershire #Oxfordshire #Herefordshire #WestMidlands #Wiltshire. Bookmark the permalink.